The time has come and you decided the ask the most important question of your life in the city of love: Rome. You might be asking the same question to yourself. 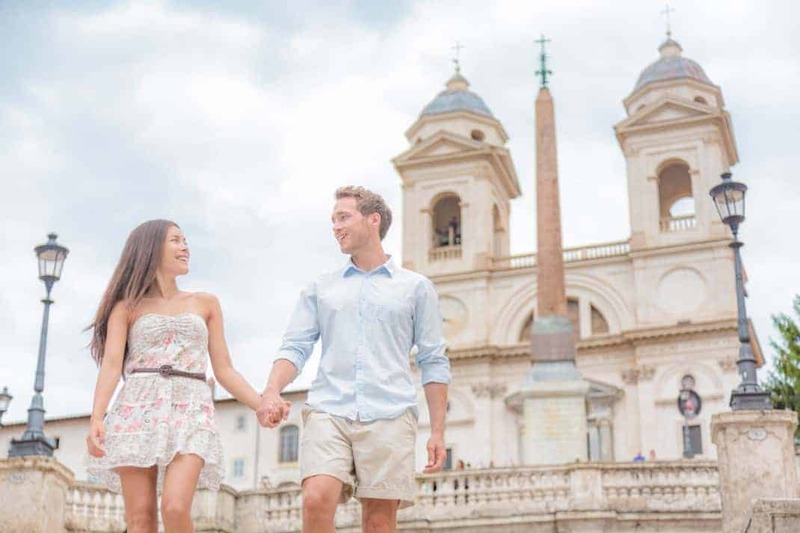 Where to propose in Rome? After all, this event will be one of the most memorable moments as a couple. In order to help you out with your special day, here are top 7 romantic restaurants to propose in Rome. A proposal can take time to plan. Especially if you are a meticulous person about this kind of events. Fortunately, you are in good hands. Rome offers you more than you can imagine in that sense. First of all, the atmosphere of this city is super romantic. You’ll see when you are going through Trevi Fountain or climbing through Spanish Steps. Another tip you should know is that Roma -the real Italian name of the city- is actually an acronym – as locals say. If you reverse the word Roma – it becomes Amor and it means “love” in Italian. Is this a coincidence? Don’t think so! Rome is full of places that you can propose. On the other hand, if you are looking for the perfect spot as a restaurant – here is our list of the most romantic restaurants for your proposal. After a session of delicious and quality food, either Roman cuisine or International cuisine, you might pop the question! L’Archeologia is a restaurant located near Appian Way which is next to the Saint Calixtus Catacombs. The outdoor seating area is enormous – the tables are covered with big white umbrellas, soothing music and many statues and sculptures around. As the name of the restaurant suggests – archeology – the place is full of mesmerizing sculptures around. The outdoor area is perfect for the proposal. Have some pasta and order a good wine here – the wine cellar looks stunning! The plates look like actual paintings and taste amazing as well. It will worth going outside of the city for this occasion. Ad Hoc is kind of a restaurant that will turn your time here into an experience. Here the food, wine, staff, and ambiance are all part of it. The setting and ambiance are pretty poetical. They offer tasting menu along with a la carte menu. The restaurant has another specialty on the menu: The truffle. You can get a truffle addition to your plates or directly order truffle tasting menu to enjoy the whole experience. Wines are great here as well – but don’t worry the sommelier will guide you for the best company for your meal. Mirabelle is a place with a jaw-dropping view – seriously. It sees central Rome from the panoramic terrace. So make sure you book the terrace in advance for the special time! The ambiance is super classy and you will feel like you are in a fairytale here or inside a royal mansion. However, everything is beautiful and fascinating that’s true – but it comes with a price. Mirabelle is not a cheap place. It’s a Michelin recommended restaurant, with a super nice terrace which has the perfect view. So get ready for that. If you are looking for a friendly and unpretentious ambiance, Piperno should be your choice. Because not everybody like super luxurious places and in the end it is just as nice to eat, good food, have some good wine and of course, sit next to your soul mate. Piperno is a typical Roman cuisine restaurant opened in 1860. The place has many specialties, starting with artichokes, fried stockfish, fried zucchini flowers, Roman-style pasta and of course Roman-style tripe. Both your hearts and your stomachs will leave this place happy – that’s for sure! Casina Valdier is a 17thcentury mansion which was built on ancient Roman cistern back then. The mansion’s architectural style is astonishing; you will feel pretty royal when you are walking inside the building. There are three separate spaces available so you can book according to your schedule and budget: Breakfast and lunch bar, cocktail and wine bar and a restaurant. Whichever place you choose, it is sure that Casina Valdier will take your breath away. It’s a spectacular place in every dimension – especially to propose. Imago is another fine dining option for you. It’s located on top of Spanish Steps inside very famous Hassler Hotel. The view is inexplicable from the terrace. The dining experience, staff, and the food are out of this world. There is an Asian twist on dishes as well. Needless to say, Imago has a Michelin star. Don’t lose yourself to the food and view here – as they are both amazing. Service is very professional and creates the amazing ambiance for you there. Ristorante Roof Garden is a magical place. The location is perfect: It’s right next to Roman forum ruins which you can actually enjoy from the restaurant’s terrace as well and also near to Colleseum. The view from the terrace, especially at night, is incredible. Most likely you will think highly of the table service here –this is what they’re really good at here and you will need is in case you’re proposing! You can come for open buffet brunch or lunch but also opt for dinner as well. Dinner is served – right alongside #Rome’s breathtaking ancient ruins ?? To book a table at Ristorante Roof Garden Hotel Forum Roma, head over to TripAdvisor!